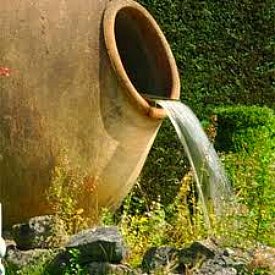 Small water features can have a BIG impact. Not ready for a backyard pond? Maybe you just don't want one. 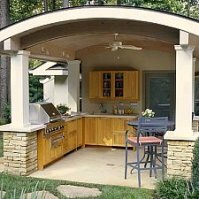 Is your backyard space limited? Maybe you want the soothing sound of running water from a water feature but you can't afford to put a lot of money into it right now. Whatever the reason, one of these small water features may fit your situation perfectly. 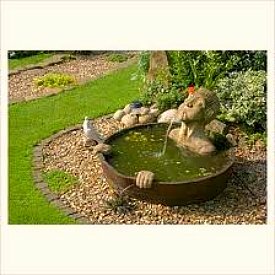 There are plenty of options for small decorative water features. 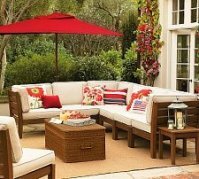 In a space as small as 3 feet by 3 feet you can have an instant focal point for your yard. 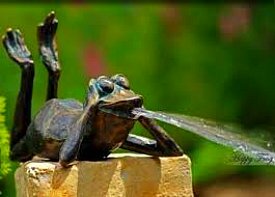 From a bubbling urn to a pouring vase - a spitting frog to a column fountain. You can even get a bird bath fountain that recirculates as it cascades to the ground. These small water features are quick and easy to install. Most can be installed by two people in just two or three hours. You will not need to worry about getting a permanent water source to your site since you can just fill it up with a garden hose. You will need to top it off from time to time due to evaporation, but that's easy enough. But you will need to have a power source to run the pump, so keep that in mind when you choose your location. 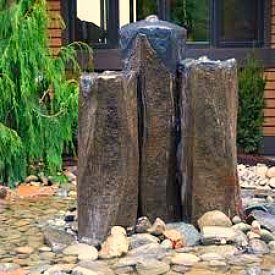 There are dozens of different styles and sizes of decorative water features. There are urns, vases, and buckets that are designed to "overflow" into the collection area. Perhaps a stone column or a set of matching columns with water bubbling from the top is more suited to your taste. If you are looking for something less dramatic and more playful, consider a spitting figurine. There are frogs, fish, birds, mammals - even a dog with his leg raised! If you want, you can even change the pieces around or alternate different fixtures without having to change the pump system. 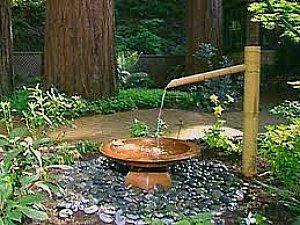 Small water features can be made of a variety of materials. Some are natural stone and can be very heavy. 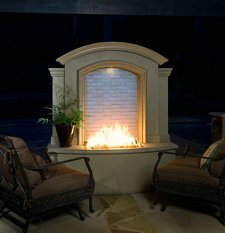 Fiberglass models are designed to look like real stone or other materials without the weight and at a much lower price. Some of the smaller figurines are made of brass. If you choose a brass piece keep in mind that it will tarnish over time. That is normal and expected - just don't expect the bright brass finish to last. It will turn green. Once you have decided on a small water feature that fits your taste, your budget and your space, finish the project by adding plants and lighting. Some modest landscaping and a soft light will make all the neighbors envious. For a relatively low cost, you can turn a boring spot in your yard into an eye catching conversation piece. Don't be surprised if you end up adding other features nearby for seating and just hanging out. You will find yourself drawn to the water.